Professor Abu Hilal specialises in liver, pancreatic and biliary surgery with a special interest in laparoscopic (key hole) surgery. He considers his sub-speciality as one of the most complex surgical specialities, where good knowledge, advanced surgical skills, hard work, dedication and enthusiasm are a must to achieve excellent outcome and to deliver a high standard of care. However, he believes that good communication, empathy and mutual trust and respect between himself and the patient are the essential pilots to reach clinical excellence and improve patient’s experience. Professor Abu Hilal has a strong academic interest and has published a large number of scientific papers, book chapters, scientific reviews and abstracts. He strongly feels that every clinician is ethically and professional expected to participate to the development of evidence based medicine through clinical and experiment research. and will always offer his patients the best treatment based on the strongest scientific evidence on which he is continuously updated. Professor Mohammad Abu Hilal does not hold a share or financial interest in this hospital, another Nuffield Health hospital or the company. 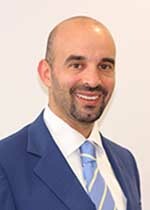 Professor Mohammad Abu Hilal does not have a share or financial interest in equipment used at this hospital or another Nuffield Health hospital. Professor Mohammad Abu Hilal does not hold any paid advisory role(s) at this hospital or on behalf of Nuffield Health.